This article is about the gate in Jerusalem. For other uses, see Golden Gate (disambiguation). The Golden Gate, as it is called in Christian literature, is the only eastern gate of the Temple Mount and one of only two that used to offer access into the city from that side. It has been walled up since medieval times. The date of its construction is disputed and no archaeological work is allowed at the gatehouse, but opinions are shared between a late Byzantine and an early Umayyad date. The Hebrew name of the Golden Gate is Sha'ar HaRachamim (שער הרחמים), Gate of Mercy. In Jewish sources[dubious – discuss] the eastern gate of the Temple compound is called the Shushan Gate. If the Golden Gate does preserve the location of the Shushan Gate, which is only a presumption with no archaeological proof, this would make it the oldest of the current gates in Jerusalem's Old City Walls. According to Jewish tradition, the Shekhinah (שכינה) (Divine Presence) used to appear through the eastern Gate, and will appear again when the Anointed One (Messiah) comes (Ezekiel 44:1–3) and a new gate replaces the present one; that might be why Jews used to pray in medieval times for mercy at the former gate at this location, another possible reason being that in the Crusader period, when this habit was first documented, they were not allowed into the city where the Western Wall is located. Hence the name "Gate of Mercy". In Christian apocryphal texts, the gate was the scene of the meeting between the parents of Mary after Saint Joseph's first dream, so that the gate became the symbol of the Immaculate Conception of Mary and Joachim and Anne Meeting at the Golden Gate became a standard subject in cycles depicting the Life of the Virgin. It is also said that Jesus, riding on a donkey, passed through this gate on Palm Sunday, in fulfillment of the Jewish prophecy concerning the Messiah. Some equate it with the Beautiful Gate mentioned in Acts 3. The gate is located in the northern third of the Temple Mount's eastern wall. The present gate was probably built in the 520s AD, as part of Justinian I's building program in Jerusalem, on top of the ruins of the earlier gate in the wall. An alternative theory holds that it was built in the later part of the 7th century by Byzantine artisans employed by the Umayyad khalifs. The Ottoman Turks transformed the walled-up gate into a watchtower. On the ground floor level a vaulted hall is divided by four columns into two aisles, which lead to the Door of Mercy, Bab al-Rahma, and the Door of Repentance, Bab al-Taubah; an upper floor room has the two roof domes as its ceiling. In 2003, access to the Golden Gate from within the Temple Mount was sealed-off by Israeli authorities, in opposition to construction plans by the Islamic Waqf who failed to secure the proper building permit. The 1st-century historian, Josephus, who mentions the "eastern gate" in his Antiquities, makes note of the fact that this gate was considered within the far northeastern extremity of the inner sacred court. 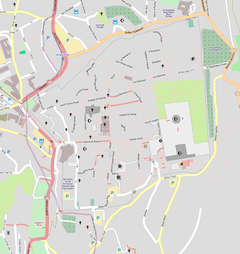 According to the Mishnah, there was formerly a causeway which led out of the Temple Mount eastward over the Kidron valley, extending as far as the Mount of Olives. Rabbi Eliezer, dissenting, says that it was not a causeway, but rather marble pillars over which cedar boards had been laid, used by the High Priest and his entourage. This gate was not used by the masses to enter the Temple Mount, but reserved only for the High Priest and all those that aided him when taking out the Red Heifer or the scapegoat on the Day of Atonement. Closed by the Muslims in 810, reopened in 1102 by the Crusaders, it was walled up by Saladin after regaining Jerusalem in 1187. Ottoman Sultan Suleiman the Magnificent rebuilt it together with the city walls, but walled it up in 1541, and it stayed that way. Suleiman may have taken this decision purely for defensive reasons, but in Jewish tradition this is the gate through which the Anointed One (Messiah) will enter Jerusalem. In relation to the Muslim belief Jesus of Nazareth is the Messiah, it is suggested[by whom?] that Suleiman the Magnificent sealed off the Golden Gate to prevent a false Messiah or "Antichrist" coming through entrance. 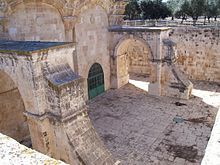 The Ottomans also built a cemetery in front of the gate, to prevent a false precursor to the Anointed One, Elijah, from passing through the gate. This belief was based upon two premises. First, according to Islamic teaching Elijah is a descendant of Aaron, making him a priest or kohen. Second, that a Jewish kohen is not permitted to enter a cemetery. This second premise is not wholly correct because a Kohen is permitted to enter a cemetery in which either Jews or non-Jews are buried, such as the one outside the Golden Gate, as long as certain laws or Halakha regarding purity are followed. The gate was sealed by Israeli authorities in 2003 because the group managing the area had ties to Hamas. The gate was kept closed in order to stop illegal construction work there by the Islamic Waqf. Israeli officials believe the work led to the destruction of antiquities from periods of Jewish presence in the area. In February 2019, the interior of the gate was reopened for Muslim worshipers, from the Temple Mount. However, the gate itself still remains sealed. 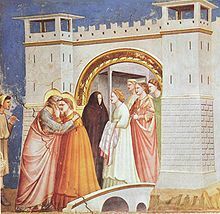 Giotto di Bondone, Legend of St Joachim, Meeting at the Golden Gate, 1305 is an early depiction of the scene. Honoring the Jewish tradition (see above) and inspired by apocryphal accounts of the life of the Virgin Mary, medieval Christian artists depicted the relationship of Jesus' maternal grandparents Joachim and Anne Meeting at the Golden Gate. The couple came to represent the Christian ideal of chastity in conjugal relations within marriage. The pious custom of a bridegroom carrying his bride across the threshold of their marital home may be based in the traditional symbolism of the Golden Gate to the faithful. In early medieval art, the now-formal tenet of the immaculate conception of the mother of Christ was commonly depicted in a form known in Italian as the Metterza: the three generations of grandmother, mother, and son. The metaphor also features heavily in the personalist phenomenology of Pope John Paul II, his Theology of the Body, a collection of reflections on this theme Crossing the Threshold of Hope were written to encourage the Roman Catholic faithful facing the challenges of materialism and increasing secularism and published on the cusp of the new millennium in 1998. The threshold between the earthly and heavenly realms symbolized by the Golden Gate represents the Mystical Body of the Church, often viewed as the Bride of Christ. In Christian eschatology, sunrise in the east symbolizes both Christ's resurrection at dawn on Easter Sunday and the direction of his Second Coming. Sanctuaries for Christian congregational worship at an altar are often arranged with respect to the east. City gates in Christian urban centers often contain religious artifacts intended to guard the city from attacks and to bless travelers. The Ostra Brama in Vilnius, Lithuania contains an icon of Our Lady of the Gate of Dawn, which is venerated by both Roman Catholic and Orthodox inhabitants. Wikimedia Commons has media related to The Golden Gate. ^ a b c "Bab al-Dhahabi". Archnet. Retrieved 27 September 2015. ^ "IRCICA / ISLAMIC ARCHITECTURAL HERITAGE DATABASE". ircicaarchdata.org. ^ a b c Eliyahu Wager (1988). Illustrated guide to Jerusalem. Jerusalem: The Jerusalem Publishing House. p. 32. ^ Gharabli, Ahmad (5 March 2019). "Waqf rejects Israeli court order to shutter Temple Mount's Gate of Mercy". Times of Israel via Associated Press. Retrieved 7 March 2019. ^ Dr. J. Randall Price. Rose Guide To The Temple. Rose Publishing 2013. p. 135. ISBN 9781596364684. ^ Issacharoff, Avi. "Palestinians celebrate victory after Israel capitulates, again, on Temple Mount". www.timesofisrael.com. Retrieved 2019-02-25. ^ staff, T. O. I.; AP. "Report: Temple Mount section sealed since 2003 reopened to Palestinians". www.timesofisrael.com. Retrieved 2019-02-25.